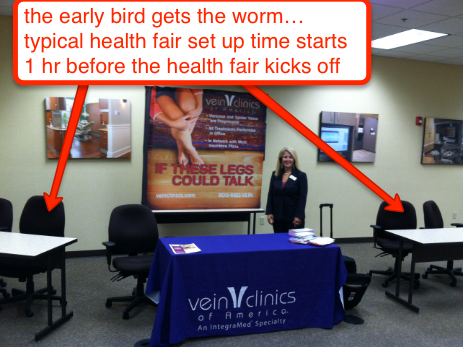 What time should I set up before the health fair starts? Vendor set up normally begins an hour before the health fair. We encourage all vendors to begin setting up at least 45 mins to an hour before the health fair to avoid setting up at the last minute, stressing the HR manager out and looking bad to the employees and other vendors. You will be rated and review on this! Also, please keep in mind that parking may be an issue and some health fair venues are not easy to get to, so many sure you account for this. It never hurts to be early. If you’re early, network with other vendors or do some computer work. Here's your chance to also speak to the HR manager about your products and services.